In 2009, Coleen founded Two Hearts Pet Loss Center, to guide people who wish to provide meaningful pet death care services in their communities, as well to be an educational resource in the pet grief discipline. In 2009, she received the first Death and Grief Studies Certification specializing in Pet Loss Companioning by Dr. Alan Wolfelt as well as releasing her first book, Pet Parents: A Journey Through Unconditional Love and Grief. She is also Certified in Thanatology and is a Certified Pet Loss Professional. By 2014, Coleen was ready to take her vision to a new level. Joining Nick Padlo as managing partner and Chief Marketing Officer, they formed an acquisition company whose mission is to standardize and raise the service levels of the pet loss industry. The Pet Loss Center strives to be the nation’s premier pet loss service, elevating the experiential component of pet loss and grief care across the country. In 2019, she shifted her position with The Pet Loss Center to an Advisory/Consultant role. Coleen is an internationally sought-after speaker on the topics of pet loss and grief. Through her delivery style, pet care professionals learn a variety of techniques immediately applicable to implement on how to companion families in their grief journey. Furthermore, her talks to pet parents give them the permission they need to not only grieve but mourn the loss of their beloved pet. Coleen is the founder and past co-chair of the Pet Loss Professionals Alliance and past president of the International Association of Animal Hospice and Palliative Care, where she currently serves as an advisor. She is a native of Kansas where she graduated from Fort Hays State University with a Bachelor of Science degree in Marketing. She currently sits on the Board of Trustees for Fort Hays State University, and is a recipient of the 2018 Alumni Achievement Award, the college’s highest recognition for graduates. Dallas, TX, is where Coleen and her husband, Chris Burke, reside. They share their home with their four-legged kids, Crisco and Rudy. 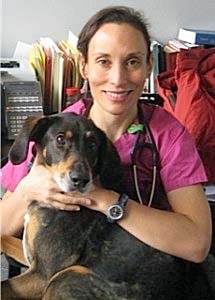 Dr. Marchitelli received her degree from Cornell University’s College of Veterinary Medicine in 2001. Shortly after graduating from veterinary school, she practiced small animal medicine in Huntington, New York for ten years. She currently practices small animal medicine in Asheville, North Carolina and has done so for th e last three years. She has provided veterinary care for companion animals at several animal hospitals in the Asheville area, including the Humane Alliance Spay/Neuter Clinic, Haw Creek Animal Hospital and Noah’s Arc Spay/Neuter Clinic of Brevard. She is especially interested in providing high quality compassionate care for pets during the end of their lives as well as the families who care for them. In addition to being a certified veterinary acupuncturist she has a special interest in advanced veterinary pain management. She is also passionate about promoting wellness care in the hopes to prevent illness in our companion animals whenever possible before it occurs. Dr. Garner enjoys getting to know each pet and their family. She believes that wellness for our pets is multifaceted, encompassing not only their physical health but also their emotional and mental well-being and their environment. Dr. Garner has a special love for cats and is especially glad to be working at a practice that is a Gold Standard Feline Friendly Practice. Dr. Garner is devoted to low-stress care for dogs too, so she is thrilled to be working at AHNA where our goal is to be fear-free for all patients. She is excited to live and work in a community committed to providing the best lives possible for all animal companions. Dr. Garner is a proud certified Fear Free Professional. Dr. Angel Mitchell has been with Bonnie Brae Veterinary Hospital since its beginning in 1991. She received her veterinary degree from North Carolina State University College of Veterinary Medicine in 1988. Her special interests include Pet Acupuncture, Chinese Herbal Medicine, Nutritional Management and Avian Medicine. She has a very holistic approach to veterinary medicine and includes conventional as well as complementary modalities in her practice. Angel is certified in veterinary acupuncture by IVAS, is a member of the American Holistic Veterinary Medical Association and has further education in Traditional Chinese Medicine.